At Grassroot Soccer, we believe knowledge is power. This knowledge includes knowing your HIV status. Yet according to UNAIDS, 25% of people living with HIV globally do not know their HIV status. That’s over 9 million people who don’t know they are HIV-positive. 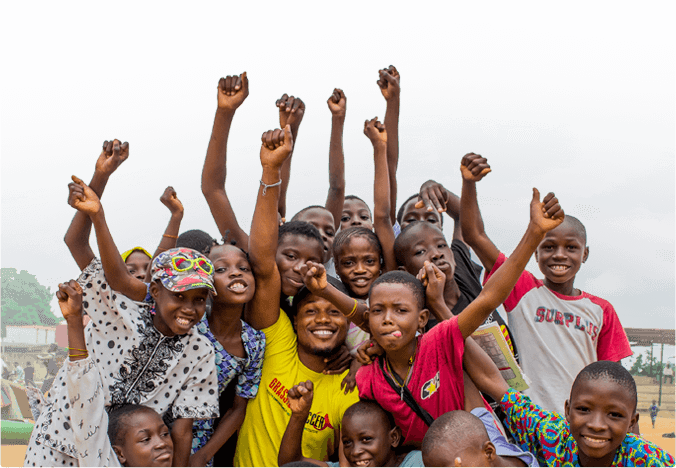 On World AIDS Day 2018, in conjunction with the global theme of Know Your Status, we present a look, in words and pictures, at how we are working with youth to increase HIV testing. Coach and participants in Alexandra, South Africa. Testing doesn’t just begin with the test itself. Stigma and fear contribute to a lack of testing in many communities, and having a trusted mentor to talk to can make a difference. In all our life-saving health and wellness programs, trained GRS coaches engage in meaningful conversations with participants. 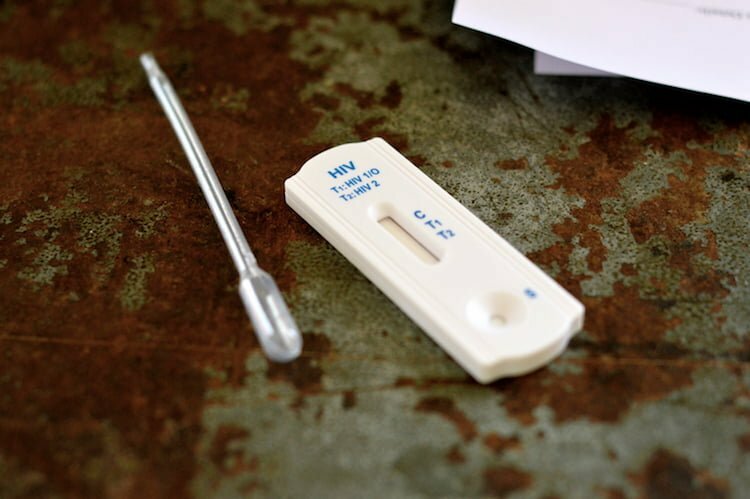 This often includes addressing their concerns and fears around HIV testing. 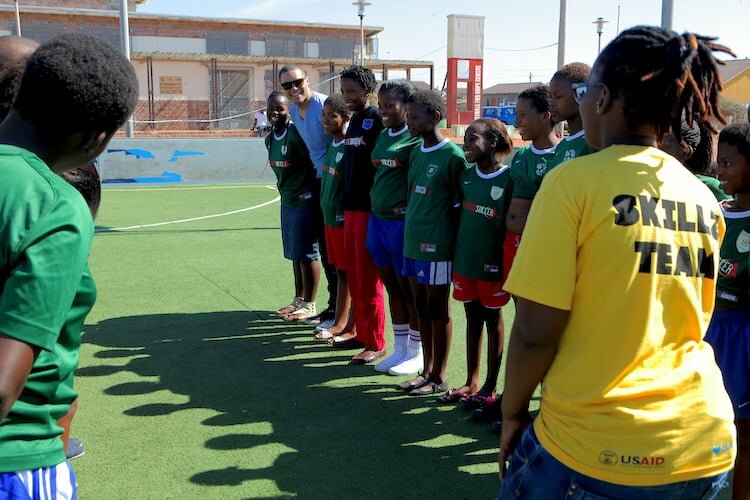 South African comedian Trevor Noah visits Grassroot Soccer’s Football for Hope Centre in Khayelitsha, Cape Town on behalf of Comic Relief’s 2015 Red Nose Day UK. The GRS curriculum includes games that address stigma, such as Find the Ball, which comedian Trevor Noah participates in above. In this activity, teams face each other in lines while passing the ‘HIV ball’ behind their backs. When the Coach gives the signal, they must stop passing the ball. Each team then takes turns guessing who on the other team has the ball. The key message: you can’t tell if someone is HIV-positive just by looking at them, just like you can’t tell who is holding the ‘HIV ball’ behind their back by looking at them. In addition to breaking down stigma, this game also reinforces the idea that the only way for someone to know that they are HIV-positive is to get tested. 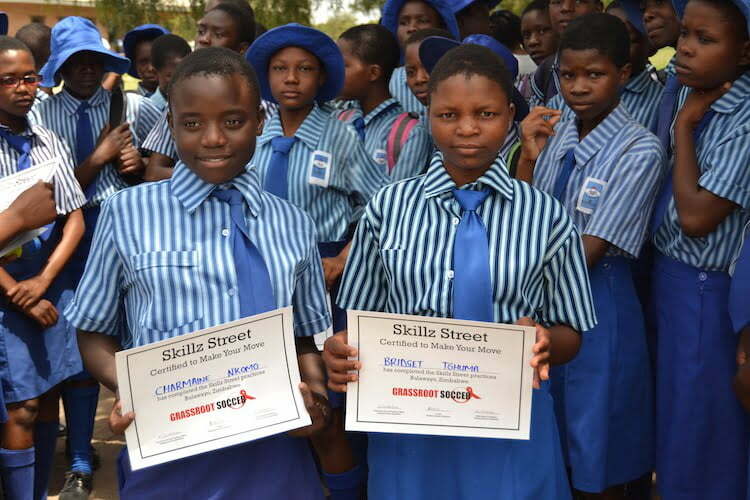 Girls in Zimbabwe at their Grassroot Soccer graduation. 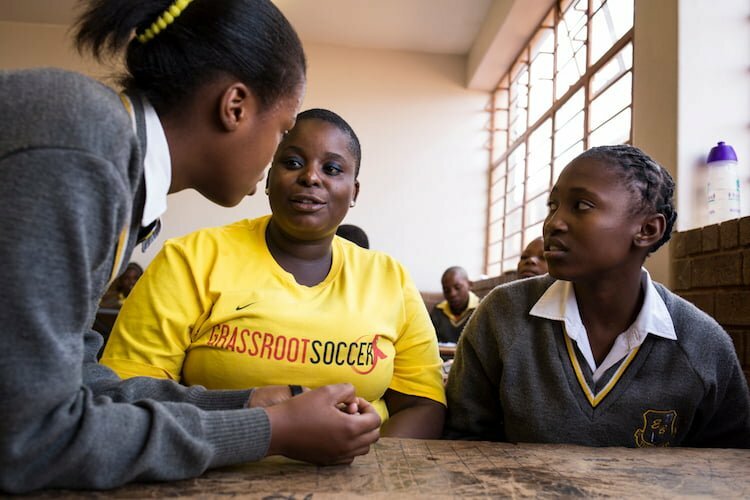 The Grassroot Soccer 3A’s approach to adolescent health begins with building the assets of young people, which includes giving them the facts around HIV testing and the confidence to test. 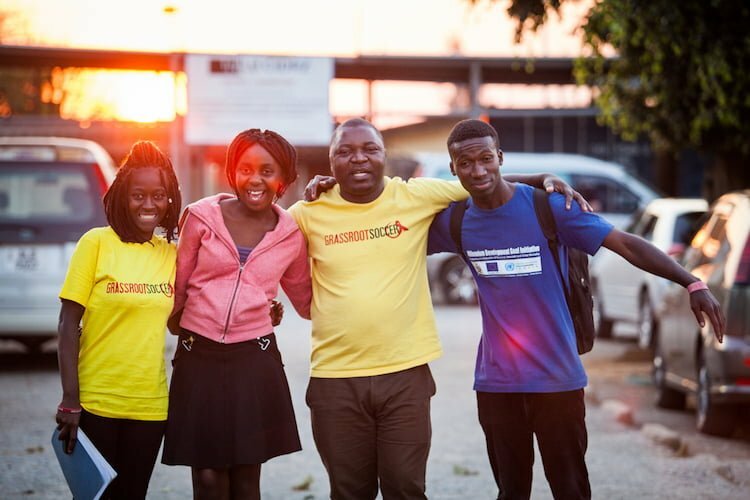 GRS participants, like those pictured above, graduate from our programs better prepared to make positive choices, like getting an HIV test to know their status. In fact, in some countries, GRS graduates are up to 53% more likely to test for HIV than the national average. 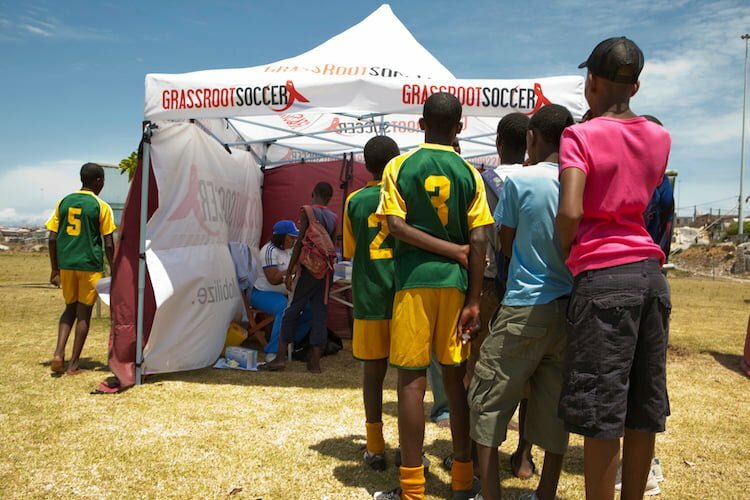 Youth line up for free HIV Counseling and Testing at a Grassroot Soccer testing tournament in South Africa. The second part of our 3A’s approach to adolescent health includes providing access to testing services, through our soccer-based voluntary counseling and testing tournaments and referrals to other testing options. At our testing tournaments, like the one pictured above, youth can get free HIV counseling and testing while enjoying a fun day of soccer and other activities. Events like these are youth-friendly and often involve whole communities. 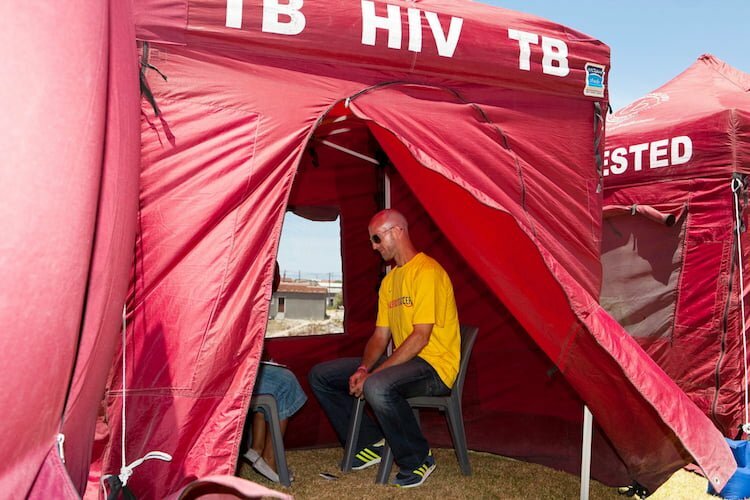 Former South African national team star Matthew Booth gets an HIV test at a GRS event. To further reduce stigma, we often call upon top-tier soccer role models to help normalize testing and encourage youth to know their status. This is one more way that soccer provides a powerful platform to engage young people. Why is testing important? Because once you know your status, you can work to keep yourself healthy. If you are HIV-positive, you can go to a clinic and get treatment and care. This will help you stay healthy and avoid falling sick. If you are HIV-negative, you can make smart choices to protect yourself from becoming infected with HIV. Coaches and participants in Zambia. As a third component of our 3A’s approach, for those who do test positive for HIV, GRS provides referrals and support to adhere to treatment. Adherence can be challenging for adolescents, and with the help and support of other HIV-positive peers and HIV-positive role model Coaches, youth in GRS programs are up to 2.5 times more likely to adhere to treatment. We believe every young person should have the opportunity to write their own story. The best version of that story includes knowing your status, so we encourage youth to know the game, make your move, and get tested for HIV!